I only wish it was this good. In ancient Japan. The 1970s. Ninjas came to kill his family. They succeed. Ninjas shouldn’t hang around after killing his family. Especially ninjas who make zero attempt to blend in. Also ninjas who seem very bad at the stealth and deadly arts. He saves only one son. A baby. He goes to America. He meets a blonde who is hot in an 80s way and wants to jump his bones. He starts a business with a man who wants to be his friend. He wants no more ninjas. He wants no more violence. He wants to raise his 6 year old son right. The business sells imported Japanese dolls. The dolls are full of heroin. He does not know the dolls are full of heroin. The 80s hottie and business partner know. He learns the truth. He is not happy with the truth. The business partner turns nasty. The business partner calls ninjas. The business partner IS A NINJA. You may recall this is just what he wanted to avoid by moving to America. He is unhappy to see the ninjas. Even though the ninjas are about as ninja-like as Justin Bieber is street. He kills the ninjas. Then he and white business partner ninja confront each other in the longest, most boring final showdown imaginable. This is the film that lazy spoof makers watch before they make their lazy spoofs. Final Rating – 4 / 10. Some would argue that this is hilarious. I disagree. 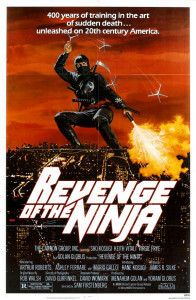 If you – like me – can’t embrace the ‘ironic entertainment value’, then Revenge of the Ninja has zero value.